Published: Mar 29, 2016 · Modified: Apr 12, 2019 · By Jen Sobjack · This post may contain affiliate links. 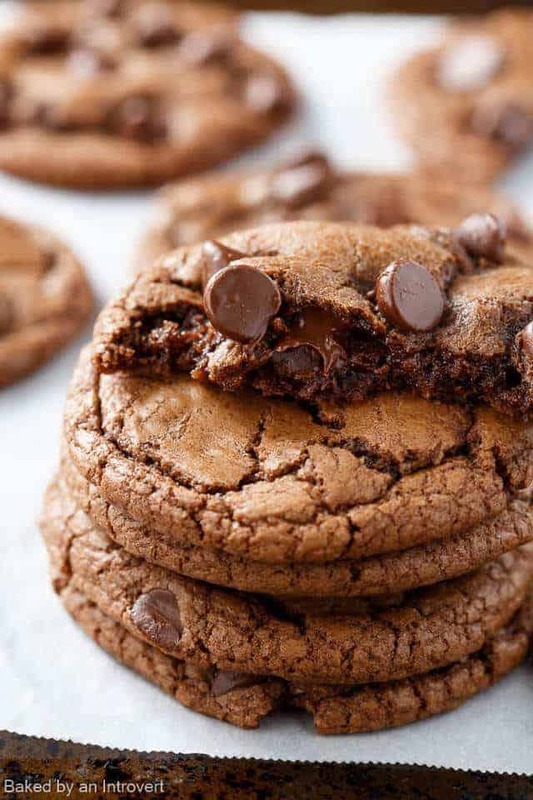 Soft and chewy Double Chocolate Chip Nutella Cookies will be a major hit with anyone who tries them! Indulge your sweet tooth with this extra chocolate-y cookie packed with rich creamy Nutella. This is the one and only chocolate Nutella cookie you will ever need! 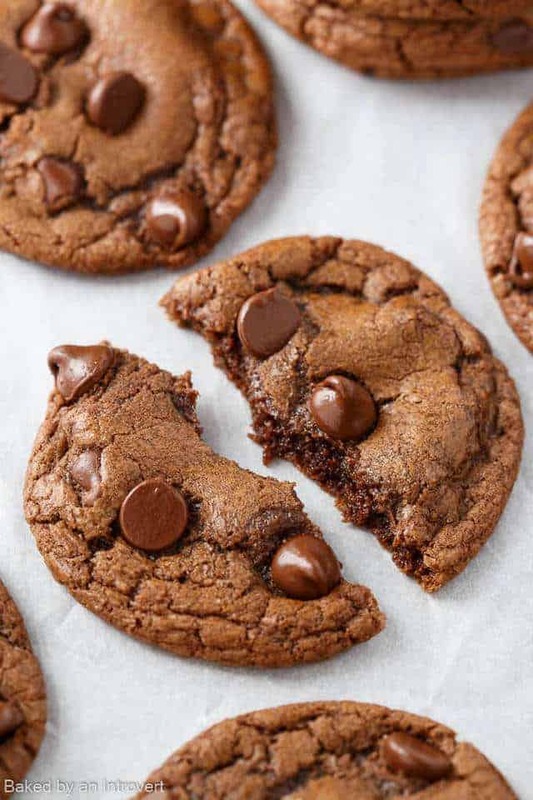 These cookies are loaded with cocoa powder, Nutella, and chocolate chips for an ultra-decadent treat that no one can resist. The cocoa powder and chocolate chips complement the Nutella, adding to its rich, velvety flavor. Each cookie is filled to the brim with chocolate chips! Fresh from the oven, the centers are soft and gooey with crisp, tender edges. Last week I shared my favorite peanut butter chocolate cookies and you all love them! Well, today I’m topping that cookie with one that’s even better! Just when you thought it couldn’t get any better, right? Let’s talk about why these cookies are so incredible. First off, the recipe is easy. Once again, the dough does not need to be chilled. You simply mix, roll, and bake. I just adore simple cookie recipes! Make sure you stir the Nutella well before scooping it out of the jar. You want those natural oils to be well distributed throughout. Otherwise, you’ll get the extra oily top layer which will cause your cookies to spread too much. They will still taste good, but they won’t be as thick and pretty. 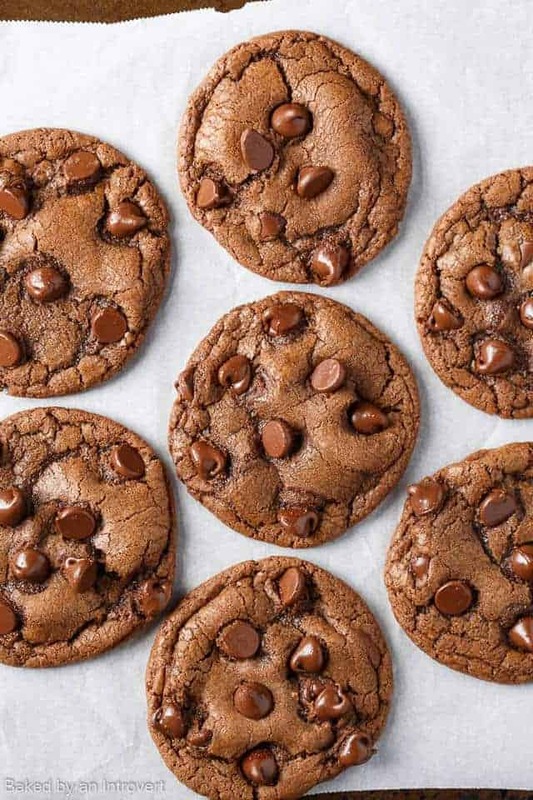 Head to the kitchen and whip up a batch of these irresistible double chocolate chip cookies. Your taste buds and stomach will thank you! So will anyone else who has the pleasure of sinking their teeth into one; that is if you decide to share! Preheat the oven to 350ºF. Line a baking sheet with parchment paper or silicone mat. Combine the flour, cocoa powder, baking soda, cornstarch, and salt in a medium bowl. Stir with a whisk to combine. In the bowl of a stand mixer fitted with the paddle attachment or with a hand held electric mixer, beat the butter and sugars until fluffy. Beat in the eggs one at a time, mixing well after each addition. Beat in the vanilla and Nutella. Slowly add the flour mixture and mix just until combined. Fold in the chocolate chips. Drop 1 tablespoon size balls of dough about 2-inches apart onto the prepared baking sheet. Bake for 10 to 12 minutes or until edges look dry. Cool on the pan for 5 minutes before transferring to a wire rack to cool completely. These cookies look so good! I’ve been wanting to make a few recipes using Nutella. These cookies are so delicious!!! They are so light and fluffy they almost melt in your mouth. I made some butter cream frosting and made some sandwich cookies out of some of them and oh my goodness so delicious!!! I love the idea of making sandwich cookies out of these. Thanks for sharing! Favorite new cookie – so glad I found this recipe! WOW, Jen! These look incredible! My mouth is watering just looking at the pictures. You can never have enough chocolate—especially if it’s combined with Nutella! I gotta try these! Thanks, Erin! You are right, there can never be too much chocolate!! Double chocolate calls for a double batch- one for me, one for my family 😉 And you can never go wrong with a little Nutella! I have a feeling these will be a hit in my household. Haha, I feel you on that one! They are definitely too good to share!! Oh my goodness Jen! 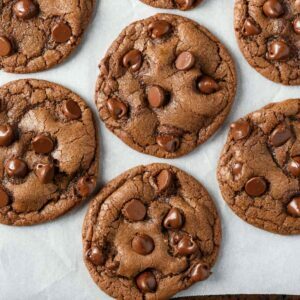 I love nutella everything and these cookies look divine! Why have I never put it in a cookie like this before?!! You totally should be making Nutella cookies! I’m going nuts for these cookies! I’ve got to make them for my momma…she’s Nutella OBSESSED and I know she would adore these. Yes!! Make them for her!! OMG, these cookies look absolutely PERFECT, Jen! The texture looks amazing and who doesn’t love chocolaty, nutella filled ALL the things!? I can almost smell and taste how delicious these are! Gimme gimme! Cheers, dear! Right?! Chocolaty Nutella should be in all desserts!! I’m in love with these cookies! Nutella addict over here. Pinned! Thank you so much for pinning!! Love soft and chewy cookies! These look so good! Sharing! Nutella and chocolate? YES PLEASE!! I think I am drooling!! These look super delicious! Love the chocolate nutella combo 🙂 Pinning! This is like chocolate chip cookies on steroids! I am completely obsessed with how ultra-chewy and soft these look, Jen! NEED! You most certainly do need these!!! The texture of those cookies is PERFECT!!! And for my Nutella-obsessed boys, this just might be the ideal dessert. 🙂 You are so talented! You are so sweet!! Thank you for always being so kind, Blair!! You had me at Nutella! These cookies look SO good, Jen! I’ve made nutella stuffed cookies before, but I’m loving all of the chocolate in here! Definitely perfect for my nutella-obsessed self!